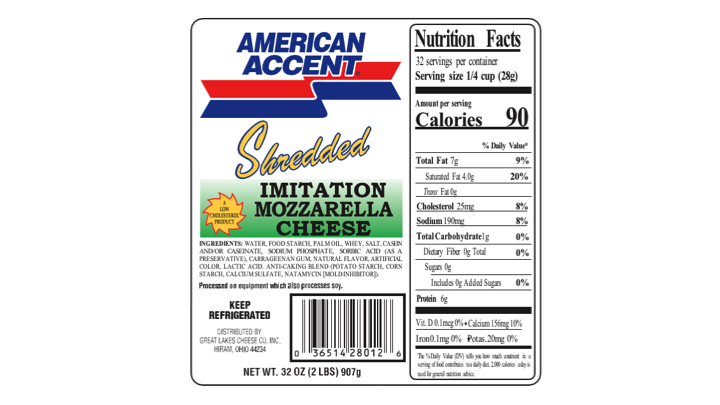 Great Lakes Cheese Co. Inc. today announced the recall of 60 packages of American Accent Shredded Imitation Mozzarella Cheese with a best by date of JUN 8 2018 because of undeclared milk allergens on its label. People who have an allergy or severe sensitivity to milk run the risk of serious or life-threatening allergic reaction if they consume these products. The product was sold in Bashas’, AJ's Fine Foods, Food City and Bashas’ Dine Markets retail stores in Arizona and New Mexico. Great Lakes Cheese initiated the recall after company Quality Assurance personnel discovered that product containing the allergens whey and casein were distributed in packaging that did not reveal the presence of milk. The ingredient statement on the affected product is correct and declares that whey and casein are ingredients of the product affected by the recall. The company has notified retailers who have purchased these products. No other products manufactured or packaged by Great Lakes Cheese are affected by this recall. Great Lakes Cheese is working diligently to eliminate any possible risk to consumers to ensure the public's safety. If you identify any of these products in your refrigerator, please discard them immediately or return to the place of purchase for a full refund. For more information or questions about this recall, please contact the Great Lakes Cheese customer care hotline at 1-800-677-7181. Great Lakes Cheese is an award-winning, premier manufacturer and packer of natural and processed bulk, shredded, and sliced cheeses. Superior cheese products are provided from coast-to-coast through nine state-of-the-art production plants. As one of the largest packagers of cheese in the United States, Great Lakes Cheese serves grocery, club and super stores as well as restaurant chains and foodservice distributors. The company manufactures, packages and distributes a portfolio of private label and Adams Reserve branded cheese products. Privately owned with over fifty years of experience, each plant is SQF Certified to meet or exceed global food safety regulations.